It's not unheard of for homes to be without A/C in cooler climates, but to also be without heating requires some serious design skill. 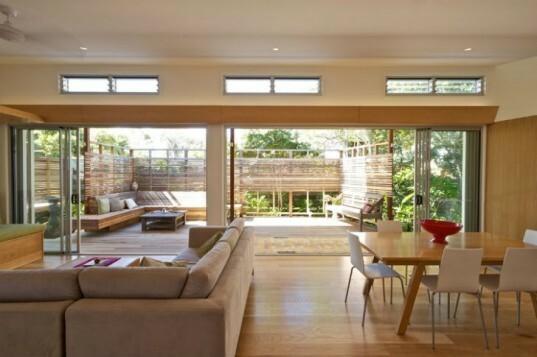 The East House in Byron Bay, south of Brisbane, is a sustainably renovated residence that takes full advantage of passive solar design. Built-Environment Practice utilized daylighting, thermal mass, a tight envelope and timber screening to eliminate the need for both A/C and heating in this coastal home. The East House Byron Bay was originally a brick home constructed in the 1990s and the owners of the home wanted to transform it into a modern and sustainable residence that supported their passions, which includes yoga, surfing, cooking, music, and gardening. Located on a standard suburban block, the home sits just across the street from a 10-mile stretch of beach. Taking into consideration the home’s proximity to the ocean, the climate and the site’s orientation, Built-Environment Practice reorganized the home to have a more open layout and a strong connection with the outdoors. The three-bedroom, two-bath home includes a large outdoor entertainment area, a yoga platform, and an outdoor shower. To achieve the energy performance and indoor comfort necessary to eliminate A/C and heating, Built-Environment Practice relied heavily on solar passive design. Overlapping spatial zones are formed with a thermal mass wall, timber screening and interlocking spatial ribbons. An east-west orientation provides optimum access to the sun for both passive solar heating and cooling. Shading, daylighting, and natural ventilation play important roles in the home’s energy efficiency. A small courtyard cut out into the home from the deck provides more space for gardening and a light well to inject more daylight inside. 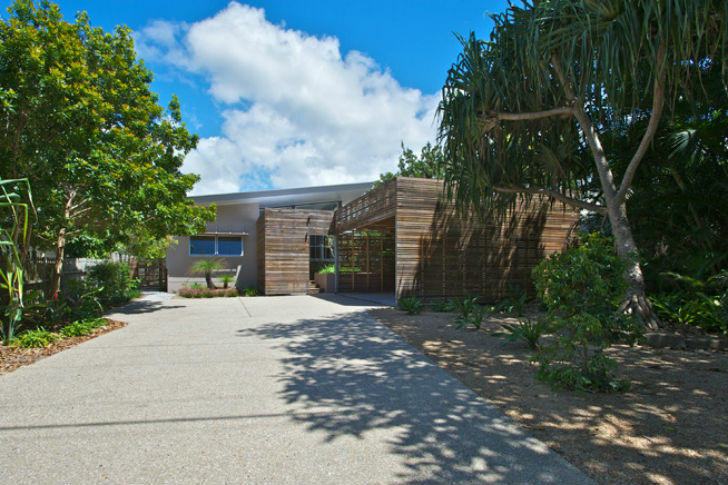 The East House Byron Bay was originally a brick home constructed in the 1990s and the owners of the home wanted to transform it into a modern and sustainable residence that supported their passions, which includes yoga, surfing, cooking, music, and gardening. Located on standard suburban block, the home sits just across the street from a 10 mile long stretch of beach. Taking into consideration the proximity of the home to the ocean, the climate and the sites orientation, Built-Environment Practice reorganized the home to have a more open layout and a strong connection with the outdoors. The 3 bedroom, 2 bath home includes a large outdoor entertainment area, a yoga platform, and an outdoor shower. To achieve the energy performance and indoor comfort necessary to eliminate A/C and heating, Built Environment Practice relied heavily on solar passive design. Overlapping spatial zones are formed with a thermal mass wall, timber screening and interlocking spatial ribbons. An east-west orientation provides optimum access to the sun for both solar passive heating and cooling. Shading, daylighting, and natural ventilation play important roles in the homes energy efficiency. A small courtyard cut out into the home from the deck provides more space for gardening and a light well to inject more daylight inside. The spacious master bath connects outside to the outdoor shower and around to the back yard. Side elevation and daylighting strategy. Material usage and design elements.